The LED materials market is projected to reach USD 12.55 billion by 2021, at a CAGR of 9.9%, in terms of value from 2016 to 2021. The base year considered for the study is 2015, while the forecast period is from 2016 to 2021. The LED materials market is driven by the increasing usage of LEDs in general and automotive lighting. 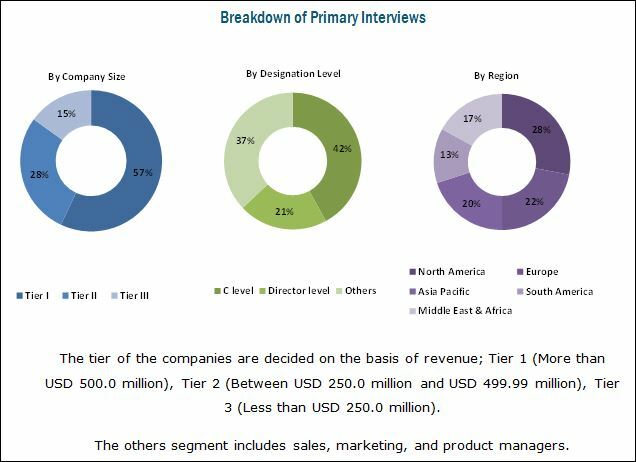 The report includes analysis of the LED materials market by region, namely, North America, Europe, Asia-Pacific, Middle East & Africa, and South America. Governments world over are focusing on reducing energy costs by implementing and developing energy-efficient devices. The Indian Government launched the Unnat Jyoti by Affordable LED’s for All (UJALA) scheme in order to replace the existing incandescent bulbs with newer and more efficient LED bulbs. The government has subsidized LED bulbs in order increase energy conservation. In 2013, according to World Bank, the per capita electric power consumption in India was 765 KWh, which was close to a quarter of the global average of 3,104 KWh. The per capita consumption in China in the same year was 3,762 KWh, after growing significantly from 2,944 KWh of 2010. India and China are rapidly developing economies. According to the National Energy Administration in China, the country accounted for the largest share in terms of total energy consumed in 2016. According to the International Monetary Fund (IMF), in 2016, China was the third-largest and India, the seventh-largest in the world, in terms of nominal GDP. Both top-down and bottom-up approaches have been used to estimate and validate the size of the LED materials market and to determine the size of various other dependent submarkets. The research study involved the use of extensive secondary sources, directories, and databases such as Hoovers, Bloomberg, Chemical Weekly, Commonwealth Scientific and Industrial Research Organization (CSIRO), Securities And Exchange Commission (SEC), American National Standards Institute (ANSI), and other government and private websites to identify and collect information useful for a technical, market-oriented, and commercial study of the LED materials market. The major players covered in the report are Nichia Corporation (Japan), Epistar Corporation (Taiwan), Koninklijke Philips N.V. (Netherlands), OSRAM Licht AG (Germany), II-VI incorporated (U.S.), and AkzoNobel (Netherlands) and other manufacturers. In March 2017, Cree launched XLamp XHP70.2 LED, a new generation of LED which produced 9% more lumen and 18% higher lumens-per-watt than the previous generation XHP70 LED. This also helped in making luminaires smaller and increase optical control for lighting applications. In October 2016, Epistar Corporation and Super Trend Lighting (Group) Ltd. (Hong Kong) signed a license agreement. This agreement allowed Super Trend Lighting to use Epistar's filament patents in its products. The patents used were limited to areas of Europe, the U.S., China, and Taiwan. In March 2016 Nichia Corporation (Japan) entered into a partnership with Future Lighting Solutions (Canada), a leading distributor of solid-state lighting technologies. The deal focuses on areas in the Americas and Europe and is limited to general lighting applications. This research report categorizes the LED materials market on the basis of material type, end-use industry, and region. What is the market size of LED materials across different countries? The global LED materials market is projected to reach USD 12.55 billion by 2021, at a CAGR of 9.9% from 2016 to 2021. The market has witnessed significant growth in the recent years, and this growth is projected to continue in the coming years. 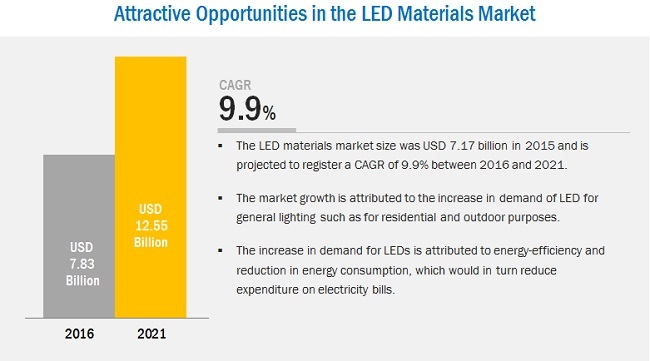 The growth of the LED materials market is expected to be fueled by the increasing use of LEDs in various end-use industries such as automotive, backlighting, and other consumer products. The different material types of LEDs included in the report are substrate, wafer, epitaxy, and phosphor. The wafers segment is set to dominate the LED materials market during the forecast period as companies are moving from two and four-inch wafer size to a more cost effective six and eight-inch wafer size production. As the yield of larger diameter wafer has significantly improved in recent years, companies have gradually transitioned to higher diameter wafer production. LEDs are used in various end-use applications such as general lighting, automotive lighting, and backlighting, and others. General lighting is the largest segment and is expected to drive the LED materials market owing to the increasing demand for LEDs in residential and industrial applications. The LED materials market for automotive segment is projected to witness the highest growth, driven by the demand for LEDs for exterior automotive lighting. The LED materials market report covers the market in North America, Europe, Asia-Pacific, Middle East & Africa, and South America. 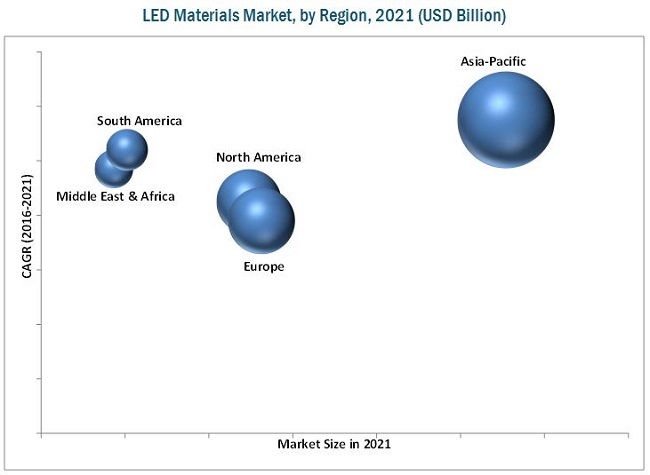 Asia-Pacific region is dominant in the LED materials market. The rising demand for LEDs in this region is mainly driven by the increased adoption rate and government incentives. Europe is the second-largest LED materials markets, globally. The market in this region is mainly driven by the growing opportunities from automotive industries. However, few factors, such as volatility in raw material prices and variable lifespan hinder the growth of the market, globally. General lighting encompasses both residential, outdoor, and industrial lighting used as lighting source during the night. LEDs in the industrial setting are involved in challenging environments such as industrial bay areas, cold storage areas, and other functional areas. LEDs are ideal for outdoor lighting and are used for street lighting for many reasons, which mainly include longer lifespan and better efficiency. In addition, they have low power consumption and better color rendering compared to traditional lighting sources. As LEDs can be switched on in instant, they are ideal for street lighting applications. Conventional lighting sources such as incandescent bulbs are not very efficient at converting electricity to visible light, with only a fraction of the electricity consumed converted into useable light and the rest wasted as heat. Although Compact Fluorescent Lights (CFLs) are more energy-efficient compared to incandescent bulbs, CFLs have shorter Life spans and are less energy efficient than LEDs. LEDs are used in different applications such as cabin illumination, display backlighting, and indication lights in automobiles. Optimally designed interior lighting can not only increase the overall appeal of the car but also reduce the driver’s fatigue especially during nighttime driving. It can also improve the perception of cabin space. LEDs have found widespread use in exterior lighting in automobiles. As the life of LEDs used in exterior applications has increased, it has garnered greater share of the automotive lighting market. Backlighting can be used in a variety of applications such as handheld devices and mobile devices. These can also be used in televisions and computer monitors. Backlighting is expected to grow at a slower pace compared to general lighting and automotive lighting, as this market is expected to saturate sooner compared to others. LEDs are used in mobile phones in order to produce a flash light. These tend to be much more versatile and can run at lower voltages compared to other sources. In addition, the LED flash can be switched on immediately, making it one of the preferred sources of flash light. LEDs are used in monitors for a variety of reasons. Typically, they are less expensive and have a broader dimming range. Nichia Corporation (Japan), Epistar Corporation (Taiwan), Koninklijke Philips N.V. (Netherlands), OSRAM Licht AG (Germany), II-VI incorporated (U.S.), and AkzoNobel (Netherlands) are the leading companies operating in this market. These companies are expected to account for a significant market share in the near future. Entering related industries and targeting new applications will enable LED materials manufacturers to overcome the effects of the volatile economy, leading to a diversified business portfolio and increased revenue. The other main manufacturers of LED materials are Sumitomo Electric (Japan), Hitachi Metals (Japan), Cree, Inc. (U.S.), and Seoul Semiconductors (South Korea). 10.11.13 Six Point Materials, Inc.